This coupling allows the panning ring to 'slip', allowing smoother pans. 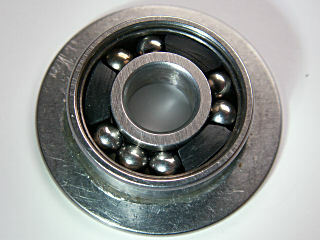 The vertical shaft of the gimbal is fixed to the centre ring of a ball bearing, and the outer ring is actuated by hand. Three short sections of soft plastic sit between tthe inner and the outer rings, and provide the necessary friction. The plastic grips the outer ring, and there is movement between the plastic and the inner ring. The ball cage has been removed. There is no lubricant in this design, other than a trace film of oil. Too much oil or grease produces inconsistent friction. Copyright © 2008 あにまるっ　のログハウス建てちゃうぞ　でっきるかな？ All rights reserved.